Do you believe in Santa? Well Santa cannot bring a trophy, but belief certainly did. Even if Juventus did not play their best game, they are undeniably the better team… on paper. But trophies aren’t won on paper, they are won on the pitch (unless you are Inter, but let’s not go there. It’s Christmas.) 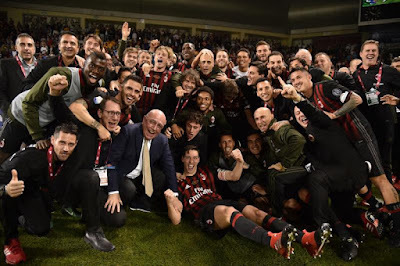 Yesterday Milan proved that there is a reason to believe, and that with belief, heart, and 120 minutes plus penalties, anything is possible. And even if the confetti has settled on the pitch, there is still that fluttering in our hearts that Milan winning a trophy gives to us. It’s beginning to look a lot like Christmas. Just like in our win over Juventus in October, Milan showed from kickoff that they belonged at this party. But it was Juve who scored first, with a Chiellini header from a corner in the 18th minute. Even if Donnarumma got his fingertips on it, it was a goal, 1-0 Juve. But the difference in this Milan from the Milan that Juve met in the Coppa Italia final in May was belief. Going down a goal did not change their belief in themselves, they played just as hard after the goal as before. In the 33rd, Alex Sandro was injured and could not continue, so was replaced by Evra. This is of note because it was one of two players that Allegri lost to injury in this match. The other would be Sturaro in the 79th. Milan know well Allegri’s history with injuries. It is also of note because it forced two of Allegri’s three subs, meaning he used all three of his subs by the 79th. A Christmas miracle, in a way, really. In the 35th, Lichsteiner got a yellow card for a foul on De Sciglio. This is of note because in the 40th, he elbowed Bonaventura in the face, which normally would have seen him sent off for a second yellow. But I suppose Damato was feeling more Santa and less Grinch. Or maybe he was still in awe of the beautiful goal Bonaventura scored from a Suso cross in the 38th for the equalizer, 1-1. Later Bonaventura would explain how thrilled he was to have scored a striker-like goal against Buffon. (He actually got it past him twice, counting the penalty.) His modesty emphasizes what an upset this match was. The second half was intense, and what a gift to the fans to see such great football. My feed picked up Allegri’s desperate screams, and it took my commentators all the way until the 76th minute to mention the sale of Milan, so you know it was a good game. 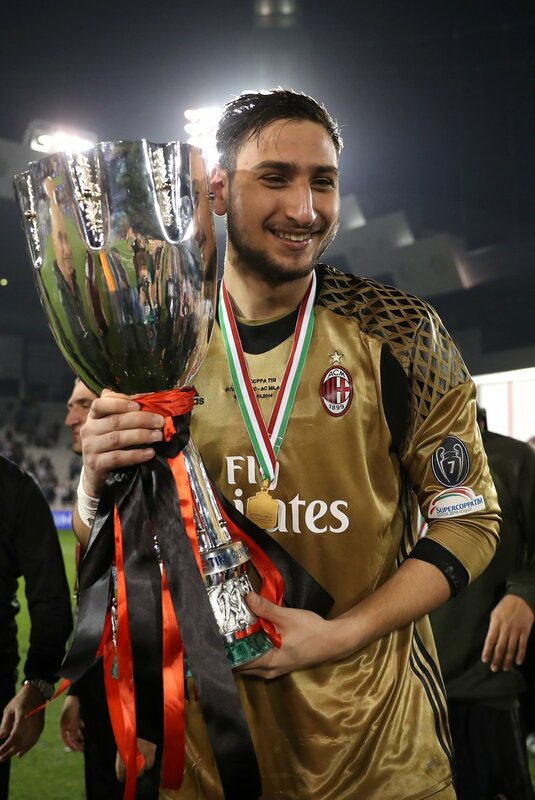 While Suso would be my man of the match in the outfield (followed very closely by Bonaventura), Donnarumma kept us in the game again and again. I believe he is on a first name basis with Paulo Dybala now, even if Dybala is being called other names by Juve fans. 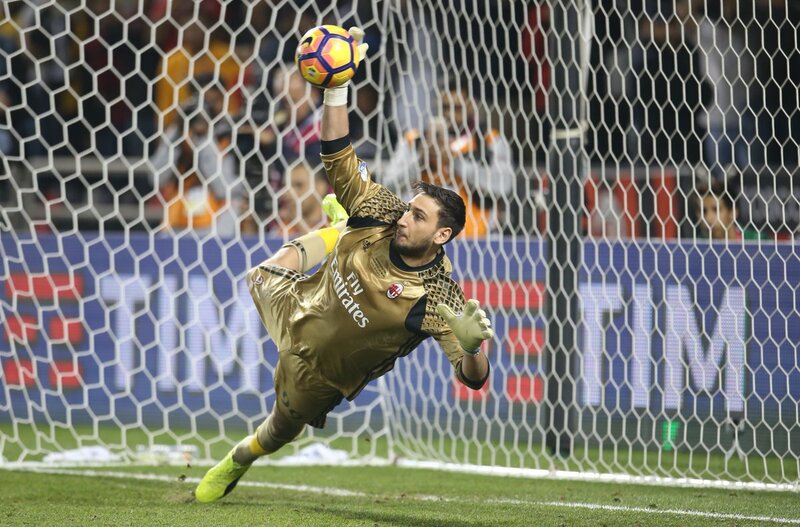 Donnarumma had a whopping eight saves in this match. Amazing. Bacca had more than one chance where a cross by Suso or Kucka was played and he couldn’t get there, but had a great chance in the 83rd when he headed the ball to bounce in front of Buffon, but Buffon showed his class. Locatelli did amazing in such a big game, but he was subbed off for Pasalic in the 73rd. And that sub may have been fateful, in hindsight. But at the end of 90 minutes, the game was still tied at 1-1, so we headed into 30 min. of added extra time. Despite the fatigue, added extra time was also intense. Not only because there was a trophy on the line, but also because of the history of the two clubs. Bertolacci was Bertolacci, though. When fouled by Mandzukic in the 98th, he went to ground and stayed, whining, just like he did every other time anyone brushed past him in the game. He is not my favorite player. In the 102nd, Montella subbed Abate and Bacca off for Antonelli and Lapadula respectively, meaning De Sciglio was wearing the captain’s armband. Milan fans probably felt a little bit of Karma when Evra’s goal in the 111th minute was called back for offside, even if it was absolutely the right call. Juventus wanted a penalty for a handball right at the death, but replays show that Damato was absolutely right there, too. But at the end of 120 minutes, the score was still even. This despite Juventus taking 16 shots with nine on goal (thank you, Donnarumma,) and Milan with 17 shots and five on goal. Thus, it went to penalties. The worst way to win or lose a game. Marchisio stepped up and scored his penalty. Then Buffon saved Lapadula’s weak penalty. But Mandzukic redeemed Lapadula by hitting the crossbar. Then Bonaventura, Higuain, Kucka, Khedira, and Suso all scored their penalties. It was 3-3. The big moment came when Dybala, having missed previous opportunities, stepped up for his penalty and the 17 year-old Donnarumma saved it in a massive way. So when the on loan Pasalic, having been subbed on earlier, stepped up and took his penalty with confidence, Milan won. They beat Juve and Allegri and took home the Supercoppa trophy. 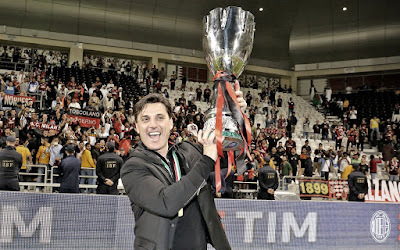 Montella’s first trophy, and the first trophy for many of our young players. To play Grinch myself, it was also Montolivo’s first trophy, at the age of 31. And though he played no part in the game or even getting Milan to where we are, as our success began when he left, he lifted the trophy with Abate. 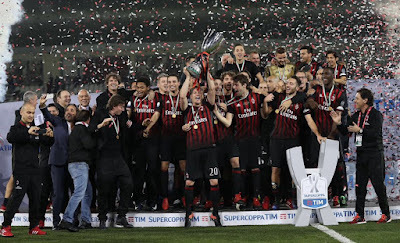 Which was weird, because traditionally, the captain who was on the pitch at the end of the match should have lifted it (meaning De Sciglio in this case.) 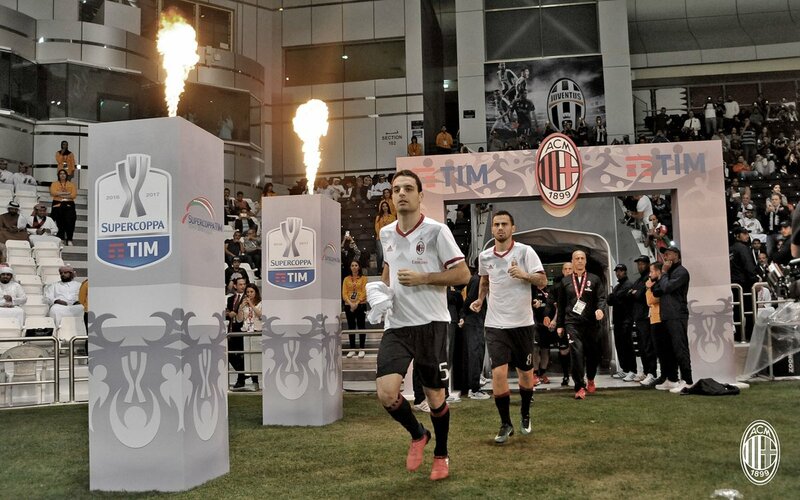 But traditionally, Montolivo never would have been captain in the first place. Whatever. It's Christmas. Fewer than 12,000 people were in the stadium to witness Milan’s Christmas miracle. A big task for Serie A is making the games, especially games like this, more accessible to more fans. I know I had to find a download after the game just to be able to watch at all. My Christmas wish is to make Serie A easier to watch for those of us who bleed red and black outside of Italy. Another Christmas wish is for Galliani to stop whining. He made such a big deal of the late plane issue, and Milan proved that it was not a "serious sporting disadvantage" after all. Defeating the top team in the league... again, a team with players whose shoelaces cost more than our squad. So another day in Doha was nothing when put up against Milan's belief in themselves. But Galliani and TV rights aside, those who bleed red and black will find a way to watch. And those of us who saw it got a Christmas gift that is priceless. We may not have a squad of players who have won everything, we may not have a squad whose players cost a small fortune. But we have a squad of players who are united and who believe. And we certainly have Montella to thank for that. And now they have won something, an official trophy that actually counts. As I pointed out in the preview, we certainly got the easy road to the Coppa Italia final and thus to the Supercoppa. But we played like we deserved to be there, and in the end, our youth and that belief gave us the edge. We won, and we deserved to win. So when that confetti came floating down like beautiful December snowflakes, it was impossible not to think that it’s beginning to look a lot like Christmas. To all of you reading out there, have a wonderful Christmas! 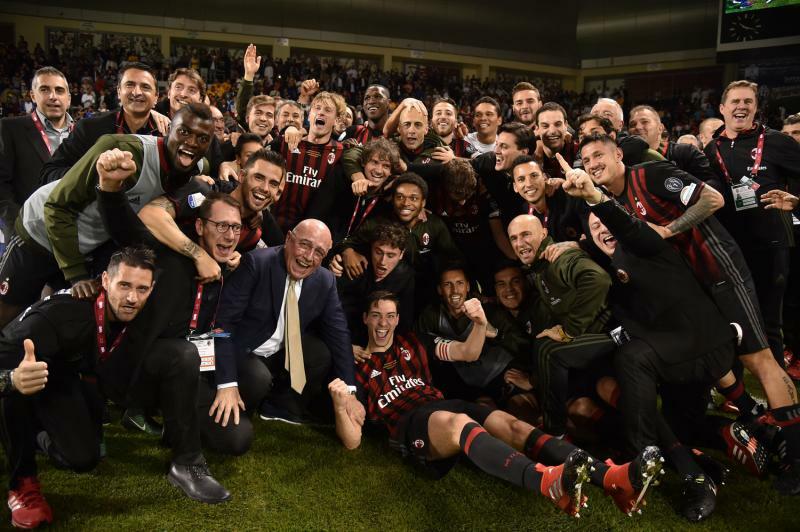 No matter how you celebrate or who you are with, Milan have given us a wonderful gift this year! And for those of you who don’t celebrate Christmas, please accept warm wishes of good will and hope… for Milan and for all of the world! Forza Milan!